Which Gift Pack is best? However, if you like the sound of a specific racehorse yourself, or the horse's name has special meaning to your gift recipient, then choose the racehorse and number of shares yourself with our 'Self Select' option. Here's a bunch of links to information about our Gift Packs - what's included, how quickly they are delivered and exactly what your recipient will receive. Select your racehorse or voucher from the options below. You'll then be asked to select a type of gift pack. You can go for a Postal Gift Pack, sent 1st Class through the post (£12.00 extra but nice to give on a special day), or an Electronic Gift Pack which is sent by email ONLY (in PDF format and £1.50 extra) which we email and you print yourself. Or you can choose to go for No Pack and just receive the account access details by email without a gift pack of any sort, which is free. Find out more about our types of gift pack. A value Gift Voucher which allows your recipient to choose their own racehorse. The budget pack includes a voucher for £100 to put towards a racehorse share. Depending on the horse your recipient chooses the budget pack may require them to add some of their own cash to cover the cost of their chosen share. 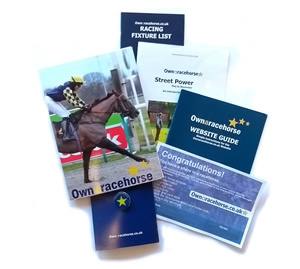 Our bestselling, recommended Gift Voucher Pack, it allows your recipient to choose their own racehorse. This £149.00 pack includes a voucher for £150 which is usually enough for your recipient to choose a single share in one of our racehorses, or they can add a little cash to the voucher themselves if the share they choose is slightly more expensive. The Premium Gift Voucher Pack costs £199 and includes a voucher for £200. Your recipient will be able to choose virtually any horse from those available. Alternatively they may wish to buy a share in two or more horses, enabling them to build up their own small 'string' of racehorses! If you really want to provide your recipient with an extra special present, then our Special Gift Voucher Pack option is the one to go for. You choose the value of the voucher, starting with a £300 voucher for £299. Purchasing a voucher value of £1499 and above may qualify your recipient for our 'Private Service' which guarantees them a share of up to 4%, guaranteed VIP badges at the races and provides them with a personal and special service. If you would like to select the racehorse(s) for your recipient, simply choose up to FIVE racehorses and then choose to add the Postal or Electronic version of the gift pack. The postal and electronic gift packs come complete with a photo and racehorse profile of each racehorse you choose for them. You can view all the racehorse shares in detail before you buy.